7 Exeter is located on the west side of Exeter, between Beacon and Marlborough, with 5 Exeter to the north, across Alley 417, and 9 Exeter to the south. 7 Exeter was designed by Peabody and Stearns, architects, and built ca. 1872 for building contractor George Wheatland, Jr., for speculative sale, one of three contiguous houses (7-9-11 Exeter). The houses were built on two parcels of land purchased by George Wheatland, Jr., from the Commonwealth of Massachusetts: a parcel at the corner of Marlborough and Exeter, with a 66 foot frontage on Marlborough, which he purchased on August 13, 1872, and a parcel to the west with a 39 foot frontage which he purchased on May 9, 1873, after the houses were completed (having previously held the right to purchase the land from the Commonwealth). He used the eastern 86 feet of the two parcels for 7-9-11 Exeter. He combined the remaining 19 feet with a 50 foot wide lot his father, George Wheatland, Sr., purchased from the Commonwealth on October 20, 1874, and built four additional houses at 225-227-229-231 Marlborough on the combined lot. When he sold the houses at 7-9-11 Exeter, George Wheatland, Jr., included in the deeds a four foot wide easement at the western edge of the lots at 7-9 Exeter to provide passage to the alley for 9 Exeter and drainage to the alley for 9-11 Exeter. He sold 11 Exeter first, in May of 1873, and included in that deed a stipulation for the benefit of the buyer assuring that any house built to the west, at 225 Marlborough, would have no windows on its eastern wall located any further south than 52 feet from Marlborough (i.e., on the portion of the wall behind 11 Exeter). When he sold 225 Marlborough in August of 1874, the boundary line between 225 Marlborough and the houses on Exeter was drawn to run through the middle of the eastern wall behind 11 Exeter, and then along the eastern face of the wall behind 7-9 Exeter (resulting in the lot at 225 Marlborough being 17 feet 4 inches on Marlborough and 17 feet 10 inches on the alley). 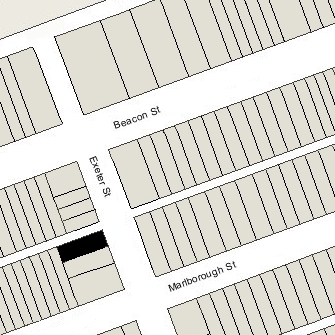 This and the earlier deed restriction prohibiting windows in the wall of 225 Marlborough behind 11 Exeter appear to have been intended to permit the owner of 11 Exeter to extend the house, using the wall of 225 Marlborough as a party wall (which, in fact, later did occur). Click here for an index to the deeds for 7 Exeter. On November 1, 1873, 7 Exeter was purchased from George Wheatland, Jr., by Professor William Barton Rogers and his wife, Emma (Savage) Rogers. On the same day, they also purchased 117 Marlborough, which they made their home. They previously had lived at the Hotel Berkeley (southeast corner of Berkeley and Boylston). William Rogers was the founder and first president of the Massachusetts Institute of Technology. When he sold 7 Exeter to the Rogerses, George Wheatland, Jr., retained a 19 foot 6 inch lot at the rear of the house. He may originally have intended to build a stable on this land, but when he sold 225 Marlborough in August of 1874, he included a provision in the deed that, for twenty years, no stable would be built on the land behind 7 Exeter. In 1875, 7 Exeter was the home of Nancy King (Dabney) Bishop, the widow of William Winsor Bishop. Her usual residence was in Providence, where her husband had been a cotton manufacturer and bleachery operator before his death in January of 1865, killed with two of their daughters in the sinking of the SS Melville. 7 Exeter was not listed in the 1876 Blue Book. On May 15, 1876, 7 Exeter was purchased from William and Emma Rogers by Miss Catharine C. Thomas. She previously had lived with her father and step-mother, banker William Thomas and Cornelia (Bangs) Thomas, at 10 Marlborough. On November 4, 1876, George Wheatland, Jr., sold her the lot behind 7 Exeter. During the 1879-1880 winter season, Catharine Thomas was living elsewhere and 7 Exeter was the home of Lurinda B, (Forbush) Barrett, the wife of Dr. William Marshall Barrett, a physician. She was secretary of the Massachusetts Women’s Christian Temperance Union. She and her husband lived at the Hotel Union at 303 Shawmut in 1878 and were living there again by mid-1880 at the time of the US Census; by 1882, they were living in Somerville. During the 1880-1881 season, 7 Exeter was the home of coal merchant Henry Kenney Horton, Jr., and his wife, Marian Glyde (Bigelow) Horton. They had lived at 254 Beacon during the previous season. 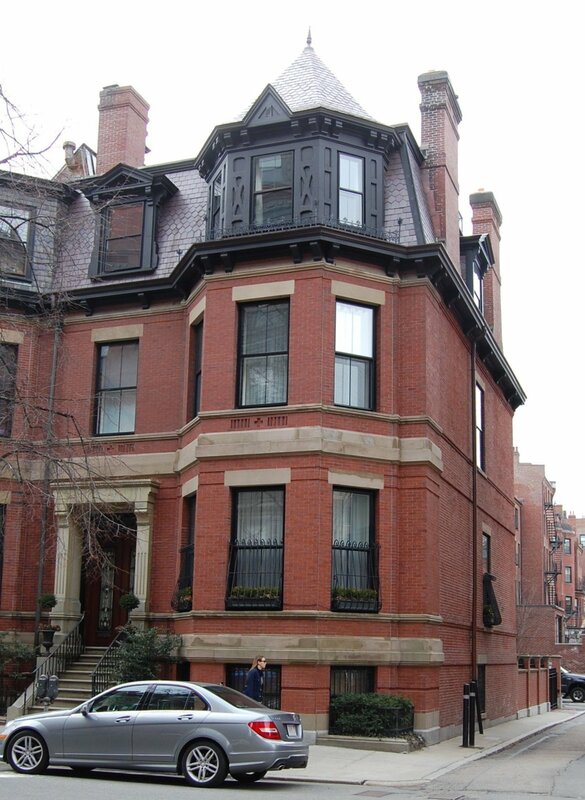 By the 1882-1883 season, they were living at 287 Beacon. 7 Exeter was not listed in the 1882 Blue Book. By the 1882-1883 winter season, Catharine Thomas was once again living at 7 Exeter. In June of 1897, she purchased 9 Exeter. She sold it in July of 1899. She continued to live at 7 Exeter until her death in 1918. On August 18, 1919, 7 Exeter was purchased from Catharine Thomas’s estate by Miss Sarah Maud Fay. She lived at 94 Beacon. 9 Exeter was the home of her niece, Mrs. Annie (Nanna) Bolton (Matthews) Bryant, the former wife of Wallace Bryant and the daughter of William A. Matthews, Jr., and Annie Bolton (Fay) Matthews. Nanna Bryant was a painter and sculptress, and may have used 7 Exeter as a studio. Sarah Fay died in January of 1921, and Nanna Bryant moved soon thereafter to her home at 94 Beacon. 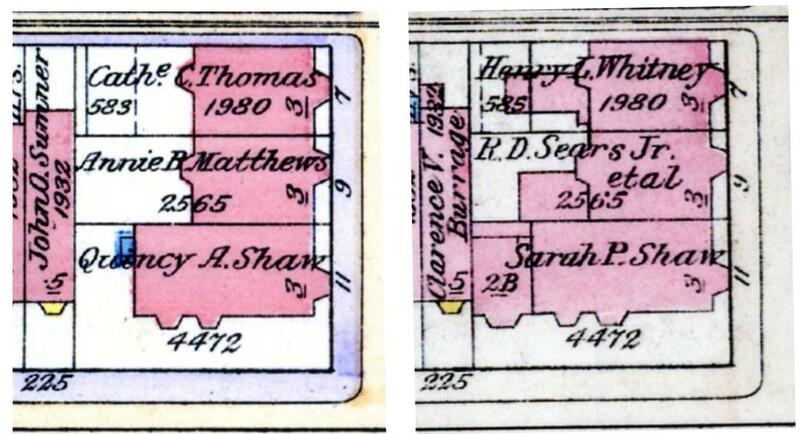 7 Exeter was omitted from the 1920 US Census and was not listed in the 1920-1922 Blue Books. On August 8, 1921, 7 Exeter was purchased from Sarah M. Fay’s estate by Henry Lawrence Whitney, a city planner for Boston. 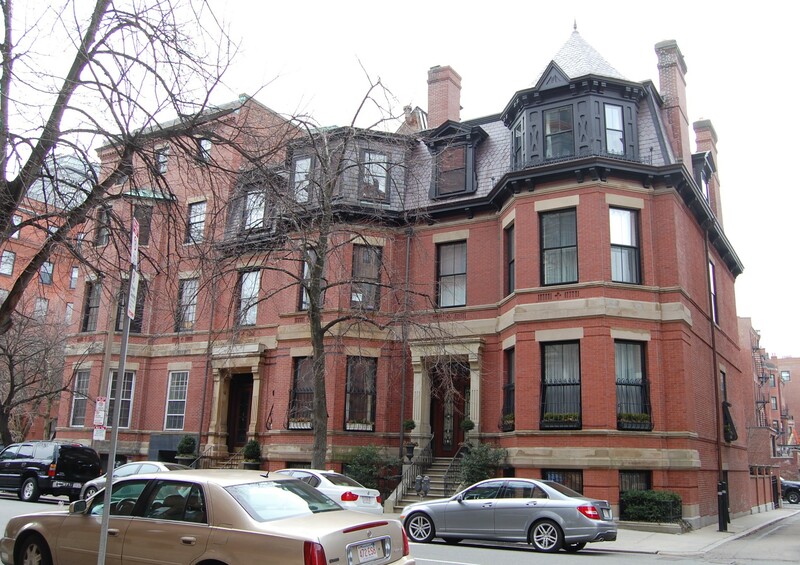 He lived at 232 Marlborough with his mother, Georgianna (Hayward) Whitney, the widow of Joseph Cutler Whitney. Henry Whitney appears to have converted 7 Exeter into a multiple dwelling, with three units. It was probably at this time that a rear ell was added; it is shown on the 1928 Bromley map but not on the 1917 map. During the 1922-1923 winter season, the residents included Mrs. Catherine (Gardner) Boyer, the former wife of automobile dealer Francis Buckner Boyer. She had moved to 5 Exeter by the next season. Also among the residents at 7 Exeter from the 1922-1923 winter season were Esther Woodruff (Smith) Hungerford, the widow of Harry Hungerford, and their daughter, Dorothy. They previously had lived at the Puritan at 390 Commonwealth. They also maintained a home in York, Maine. They continued to live at 7 Exeter during the 1926-1927 season, but moved thereafter. Henry Whitney married in August of 1923 to Rosamond Houghton and they made one of the apartments at 7 Exeter their home. They also maintained a home at 676 Brush Hill Road in Milton (one of the oldest houses in Milton, built in 1663 by Robert Tucker). 7 Exeter continued to be a multiple dwelling, with five units by 1928. By the 1929-1930 winter season, Rosamond (Houghton) Whitney’s brother and sister-in-law, Henry Oscar Houghton, III, and Marcia Elizabeth (Clark) Houghton, were living in one of the apartments at 7 Exeter. They had married in 1929 and 7 Exeter probably was their first home together. They continued to live at 7 Exeter during the 1930-1931 season, but moved thereafter to Brookline. Henry and Rosamond Whitney continued to live at 7 Exeter until about 1937, when they made their home in Milton their year-round residence. 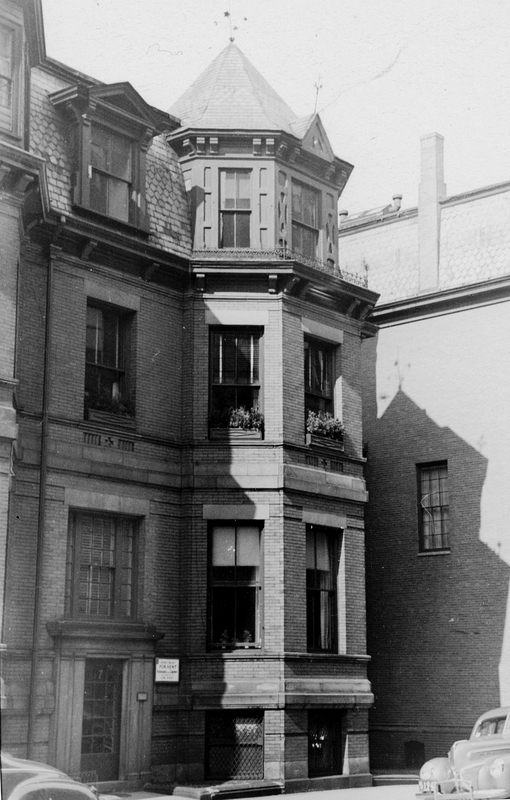 From about 1942, one of the apartments at 7 Exeter was the home of Henry Lowell Mason, Jr., an attorney, and his wife, Fanny Crowninshield (Homans) Warren Mason. They had married in August of 1939, after which they had lived at 37 River. 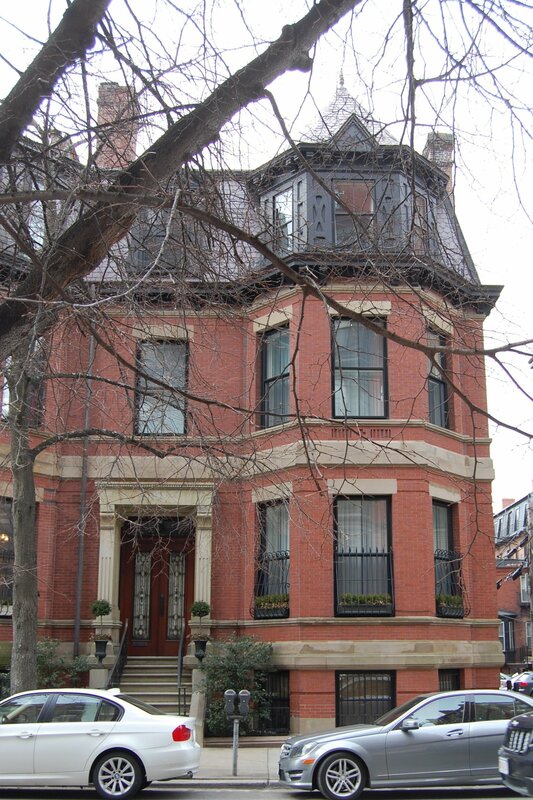 Before their marriage, he had lived at 134 Beacon with his parents, Henry and Estella (Kimball) Mason. They continued to live at 7 Exeter in 1947, but had moved to 289 Marlborough by 1948. On June 24, 1959, 7 Exeter was purchased from Henry Whitney by real estate dealers Stuart H. Hastings and Joseph A. Gautreau. It continued to be an apartment house with five units. On September 15, 1959, 7 Exeter was purchased from Stuart Hastings and Joseph Gautreau by The Work of God, Inc.
On September 25, 1967, 7 Exeter was purchased from The Work of God, Inc., by Webster F. Williams, Jr. He lived in one of the apartments. In June of 1992, he filed for (and subsequently received) permission to construct a driveway giving access to the rear of 9 Exeter, and on December 28, 1992, he entered into a reciprocal easement agreement with J. Brent Finnegan and Karen Finnegan, owners of 9 Exeter, for the construction and use of parking spaces behind 7 Exeter and 9 Exeter. On March 22, 1996, 7 Exeter was purchased from Webster Williams, Jr. (by then a resident of Cumberland, Ohio) by Linda E. Hall, trustee of the Seven Exeter Street Realty Trust. On March 4, 1997, 7 Exeter was purchased from the Seven Exeter Street Realty Trust by Robert M. Barsamian, trustee of the Exeter 7 Holdings Trust. In April of 1997, he filed for (and subsequently received) permission to convert the property from a five-unit apartment house back into a single-family dwelling. The property changed hands. It remained a single-family dwelling in 2016.